From Seattle it is a three-hour flight to Fairbanks. On arrival, I met two of the group I was to be travelling with at the airport, Kathy, a lawyer from Seattle, and Robert, a PhD student from LA. Together we took a taxi to the hotel in Fairbanks where we were to meet the rest of the group comprising Aaron, our guide, and Amanda, a pharmacist from New Hampshire and her husband, an engineer called Scott. Aaron had initial bad news for some of our group. Our flight to Kaktovik the following day had been cancelled. Aaron, Kathy and I were booked on a later direct flight, but the remaining trio faced a very early start and a three-leg trip up to Alaska’s far Northern reaches. Despite the early start for the unlucky trio, we decided to go out and see if the Northern Lights were visible that night. They were, but it was partly cloudy so although we took a few pictures the results were not very impressive. However, it was a chance for us to familiarise ourselves with the settings needed in order to be able to photograph at night. When it clouded over even further we decided to call it a night and head to bed. In the morning, I was surprised to see Scott at the hotel when I emerged for breakfast. He was supposed to have left two hours before. It turned out that the flights for the three who were flying indirectly to Kaktovik had not been confirmed by the airline and had been cancelled. Again. In order to resolve it, Aaron had to wait for the airline’s desk to open. So far the little local airline, Ravn, had not covered itself in glory. However, in the end flights were found for the three which would get them to Kaktovik that day, although they had to change in Prudhoe Bay where they faced a dash from one terminal to another. This mean a walk of about a mile in raging, freezing winds dragging all of their kit with them. Nevertheless, we were eventually all united in Kaktovik. The remaining three of us had an uneventful and scenic flight on the tiny twin-prop plane over some of Alaska’s mountains. But I don’t want whale for dinner again! Kaktovik is a tiny town of 300 people. The airport consists of a landing strip in front of a hanger. There is no terminal. The luggage from the plane was offloaded by the pilot with the help of the local policeman. The policeman pointed out the number of Amazon parcels that were being offloaded from the plane. This affords much better value than trying to shop in the town where, due to the remoteness of the location, prices are very high. It was very cold but there was not a lot of snow, the strong winds having blown most of it away. However, we could see from the fact that some of the sea was frozen over that it was very cold indeed. Our hotel, the Marsh Creek Inn, consisted of a slightly sorry-looking bunch of Portakabins but it was nice and warm – as was the welcome. 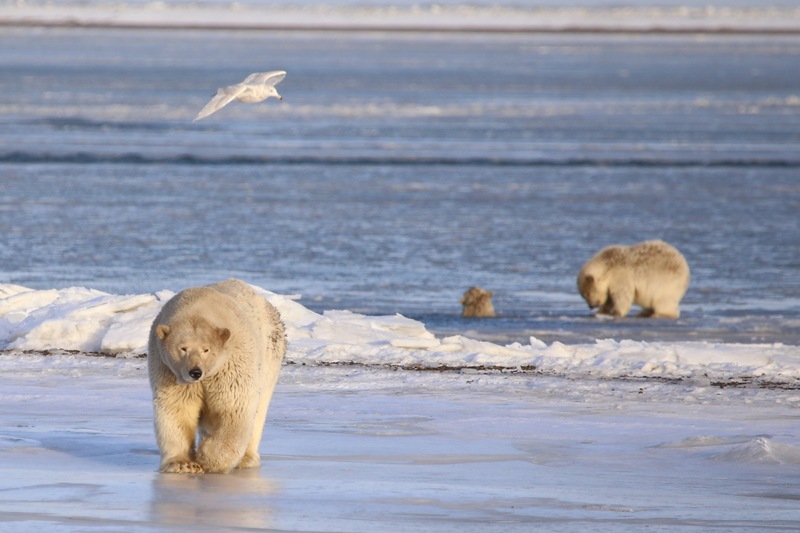 After settling in, having lunch and gathering up the three weary travellers, went for a brief drive in the afternoon looking for polar bears. 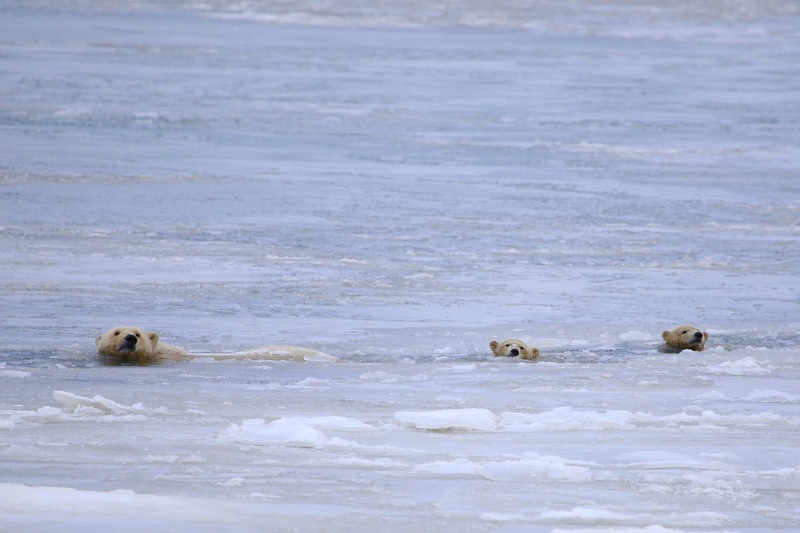 We managed to see one bear swimming in a hole in the ice in the distance. It was encouraging to see that the bears were out there and we were to have our first trip with our local guide the following day. To my surprise the food was excellent at the Marsh Creek Inn, and after a hearty breakfast we set off with our local guide Don and his assistant Bailey. Don explained that he was unable to launch his boat that morning as the ice had pushed it too far up the beach. However, we set off in his plan B, a converted school bus which had been stripped of its seats and had a platform built on top from which photographers could photograph the bears in relative safety. The disadvantage of the bus was that it only had four windows on each side which could open allowing only four photographers access at any one time unless someone was on the roof. As there were five of us (or six including Aaron) this would prove to be a problem later. On that first morning we got on the bus and drove down to the bone pile. The bone pile is the remains of whales which are slaughtered by the village each year and their remains left on the beach where they are landed. 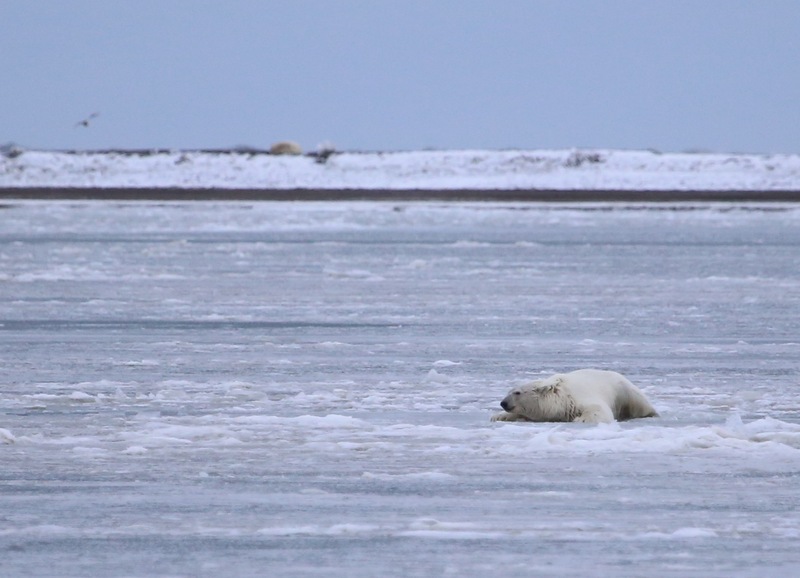 Kaktovik has a quota of three whales each year which they are permitted by the IWC to kill. They do this in the autumn and the whale is butchered on the beach and divided and shared between the crews of those that caught it and their families. 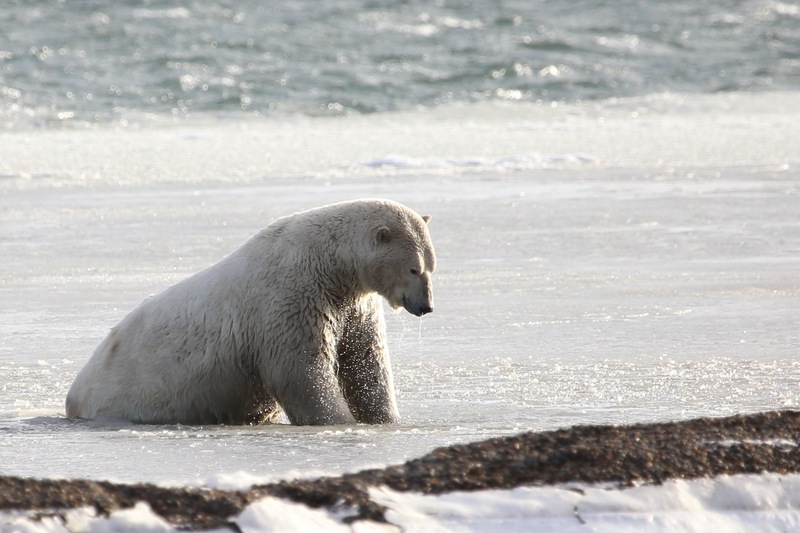 As soon as they bring the whale to the beach it starts to attract polar bears. 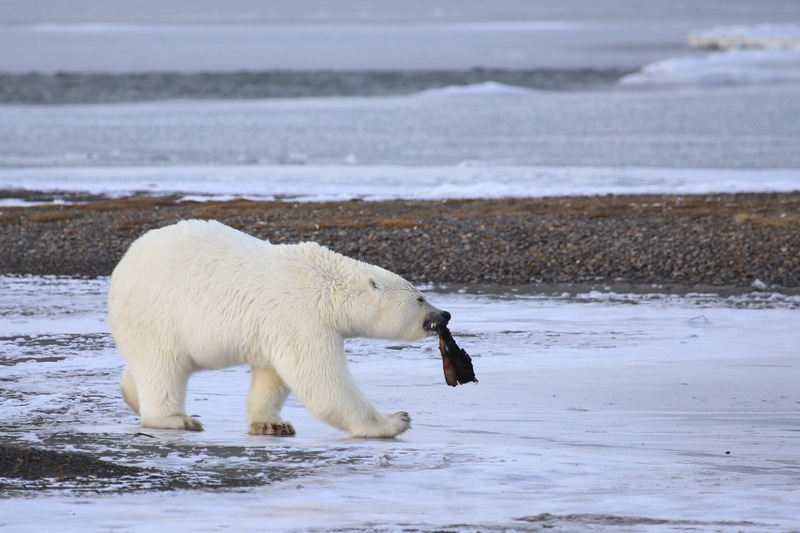 Therefore they take some of the carcass and deposit it at either end of the beach in order to spread the bears out a little. As we drove through the village we could see piles of whale meat outside each house. Outside one house was a small bulldozer with the bucket loaded with chunks of whale. 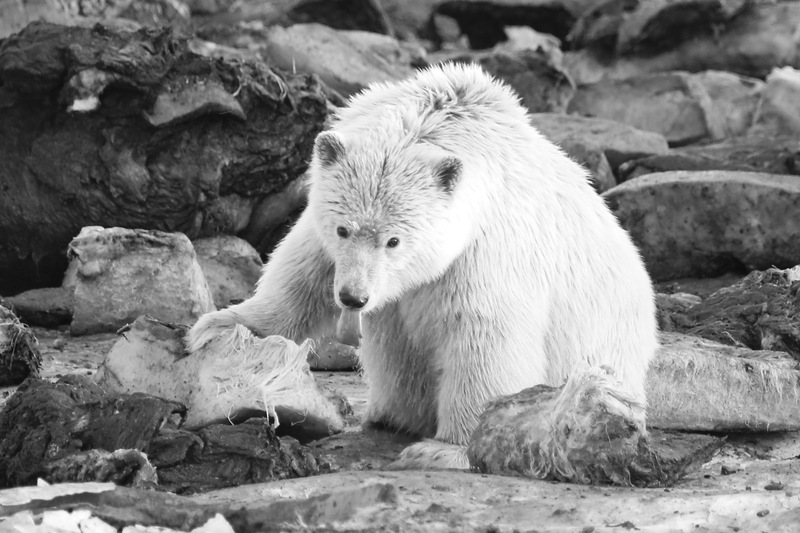 In the freezing temperatures it doesn’t spoil and enough of the carcass remains on the bones on the beach to keep the bears out of town – hopefully. 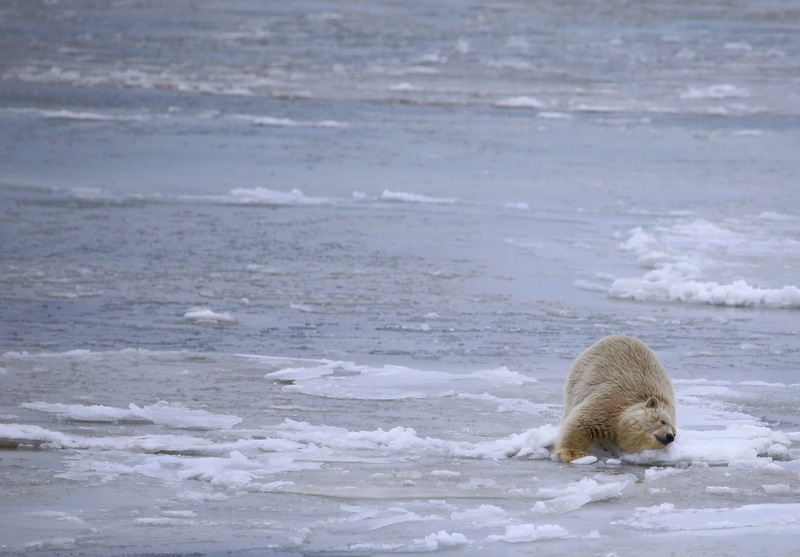 There is a polar bear patrol which chases any bears which do venture into town away with crackers. 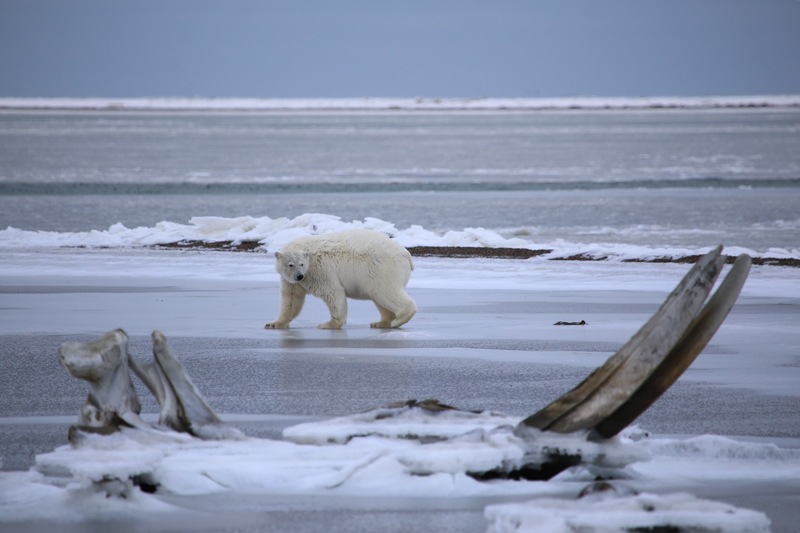 On that first day on the bus we were able to climb on top of the bus and see bears being attracted to the bone pile to eat their fill of whale meat and blubber. Once they have done so they head out onto the ice to sleep. 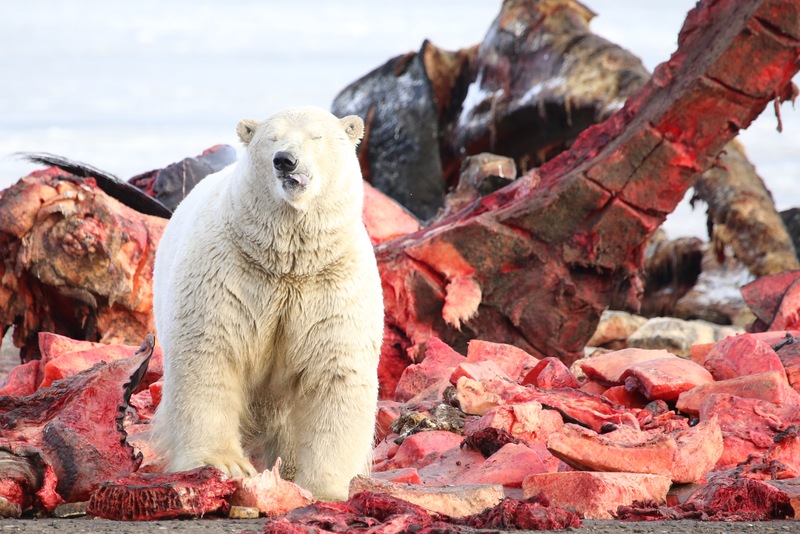 We were delighted to see our first polar bears close up even though some of the photos we took of them on the bone pile were rather gory in their backdrop. After another rib-sticking meal at the Marsh Creek Inn, we set off on Don’s boat that afternoon. This was a small fishing vessel with a small heated cabin. 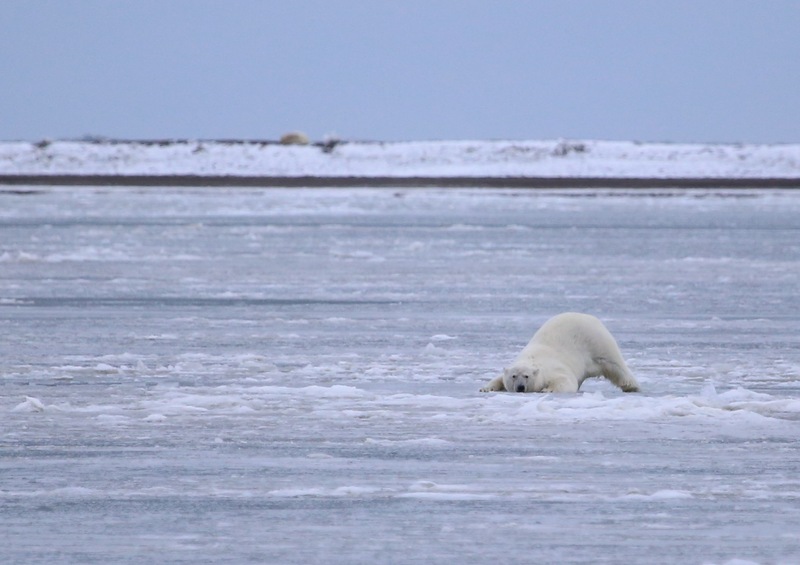 As the only polar bears we could see were sleeping piles of fur in the distance, I spent my time talking to Don who told me about his daughters and how they had recorded an oral history of the town by speaking to the town’s elders. 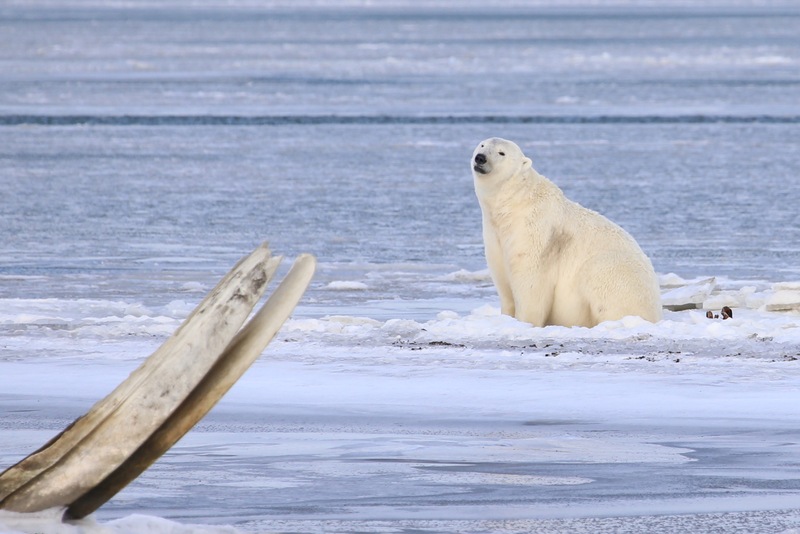 The area we could cover in the boat was reduced by the encroaching sea ice and, despite some icebreaking with the boat, we were not able to get close to the bears and we returned to shore. We had to get off the boat via a stepladder which Bailey held against the prow. I managed not to fall into the freezing Arctic water from the slipping ladder, but I confess I was rather nervous. If anyone was going to do something stupid like that, it was likely to be me. The increasingly strong freezing winds the following day soon made it clear that we would not be heading out on the boat again. We had had more success on land than at sea and it was plain to see that the freeze this year was coming early. 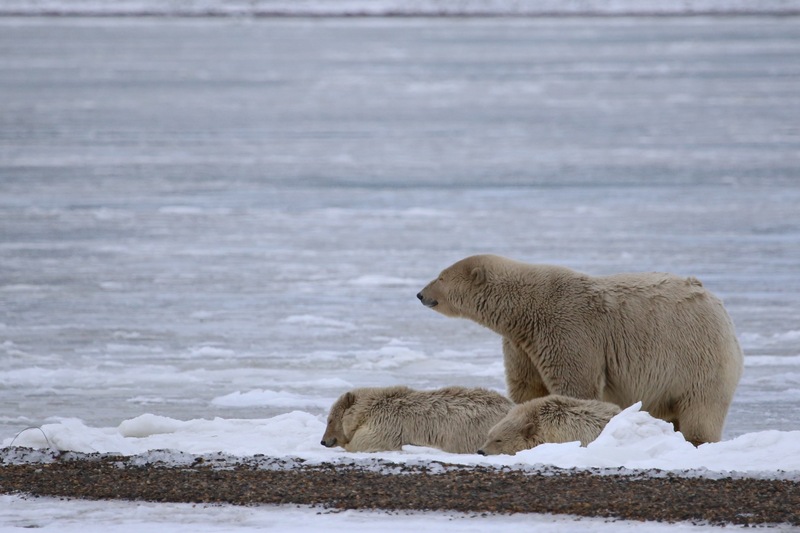 The lack of snow meant that the bears that we saw most often, a mother and her two cubs, were rather dirty. However we had great fun watching the antics of the cubs. 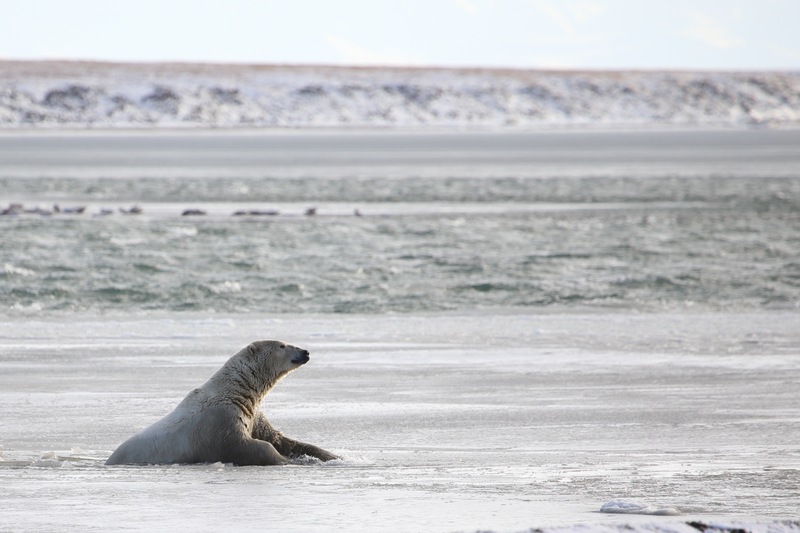 They spent a great deal of time practising breaking through the ice, a technique that they will need to master in order to hunt for seals once they are independent of their mother. 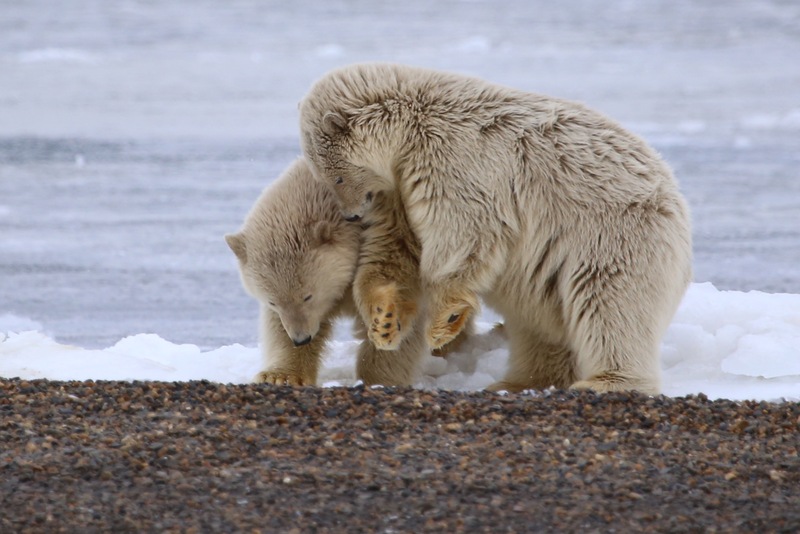 At one stage, one cub was swimming whilst the other was pounding the ice next to him making it look like he was playing a game of whack a mole with his sibling. Sitting watching the bears from the school bus we were able to observe quite a lot of polar bear behaviour. 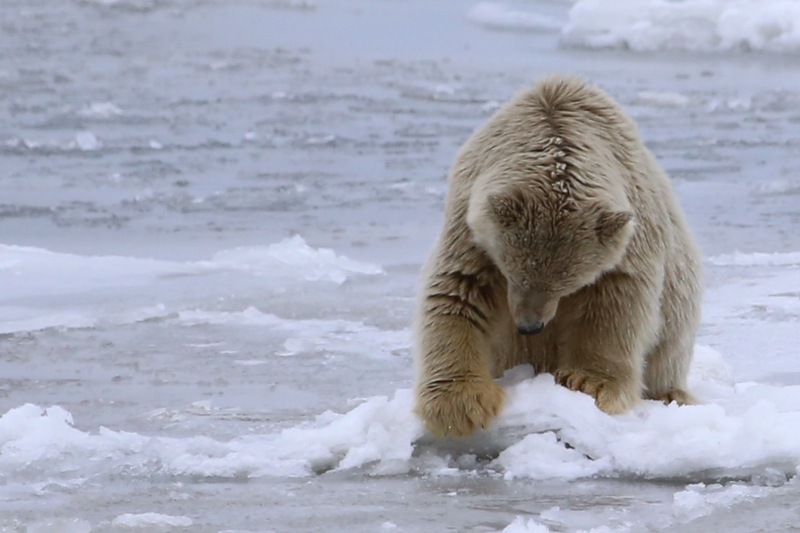 We saw lots of playing from the grubby twins, racing each other, playing with a seal’s skin they found, sliding on the ice, as well as lots of practice punching through the ice. 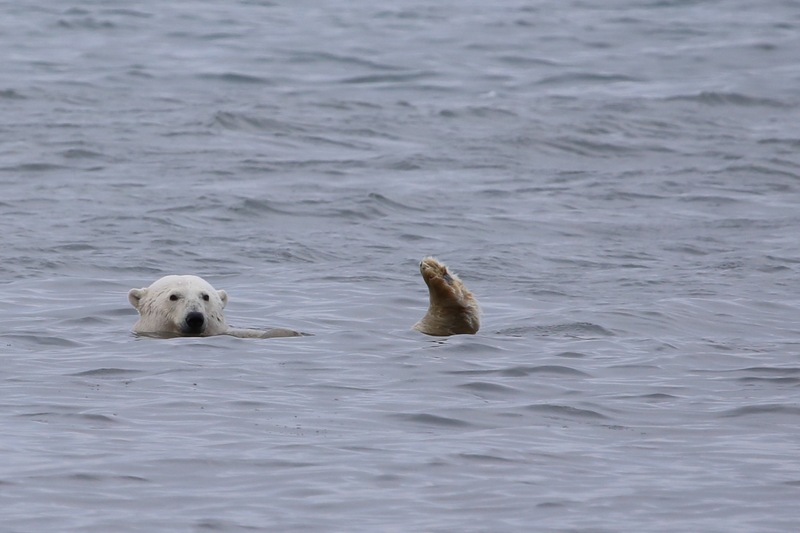 As we watched the older bears emerge from the water, we could see how they flopped onto their bellies to spread their weight, making for a practical if somewhat undignified exit. 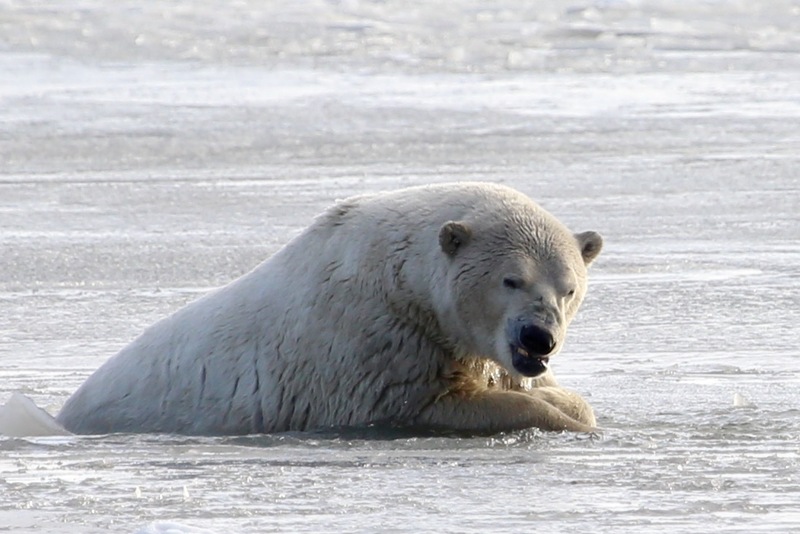 Every time a bear encountered thin ice, it would spread its paws in a comical low-slung waddle to spread its weight. 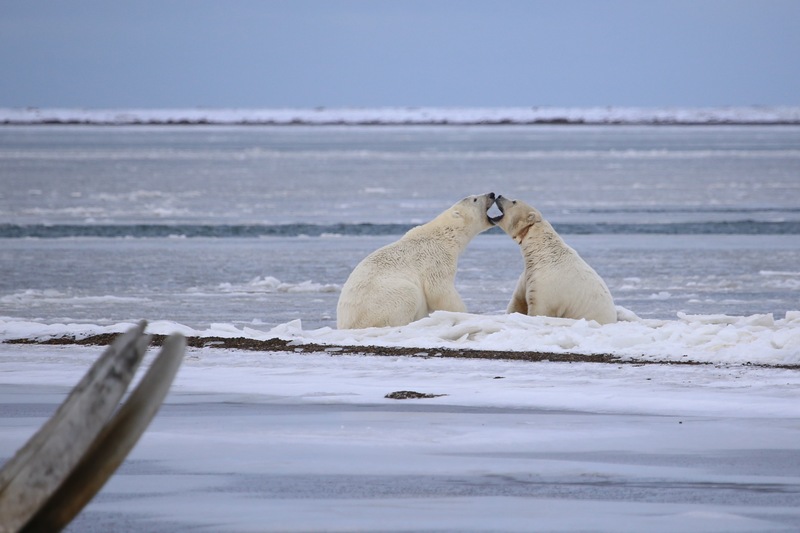 We even saw a bit of polar bear romance, with one huge boar approaching a sow with a gift of a bit of meat, which they shared back and forth between them, although she did seem to be playing rather hard to get. 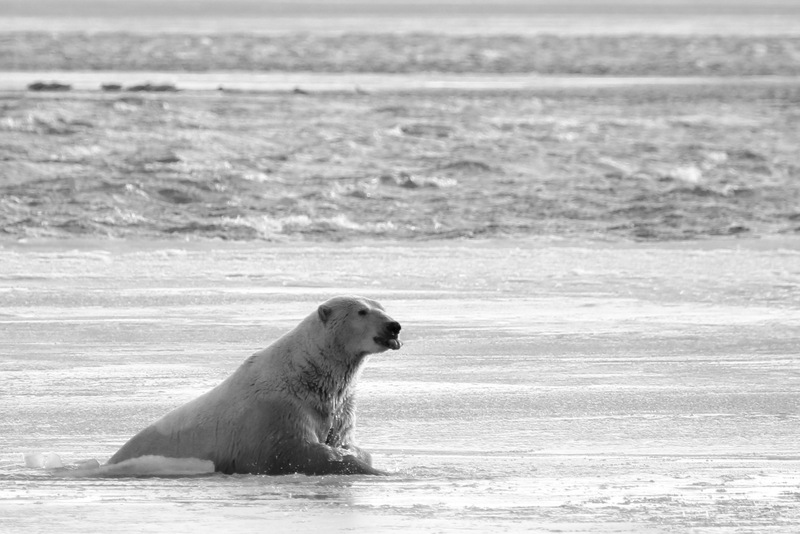 They are so at home in the freezing environment, not taking shelter from the ferocious and biting winds, and happy to leap into the icy sea. We also saw a bear confirm that the answer to the age-old question is no, not always in the woods! Disaster struck for me on that second day as I was caught by a strong gust of wind which knocked me off-balance and I slipped on the ice as I was about to board the bus. Cradling my camera protectively I landed squarely on my poor sore back and gashed my shin against the bus door. Fortunately my ski pants cushioned both my shin and my rear end somewhat from the impact. Let me run you through arctic clothing. I was wearing two base layers, a fleece, a down jacket, a shell, long underwear, ski pants, two pairs of socks, winter boots, a hat and a neck gaiter. The fall proved very painful but what was to be even more painful over the next day and a half was the attitude of Bailey. 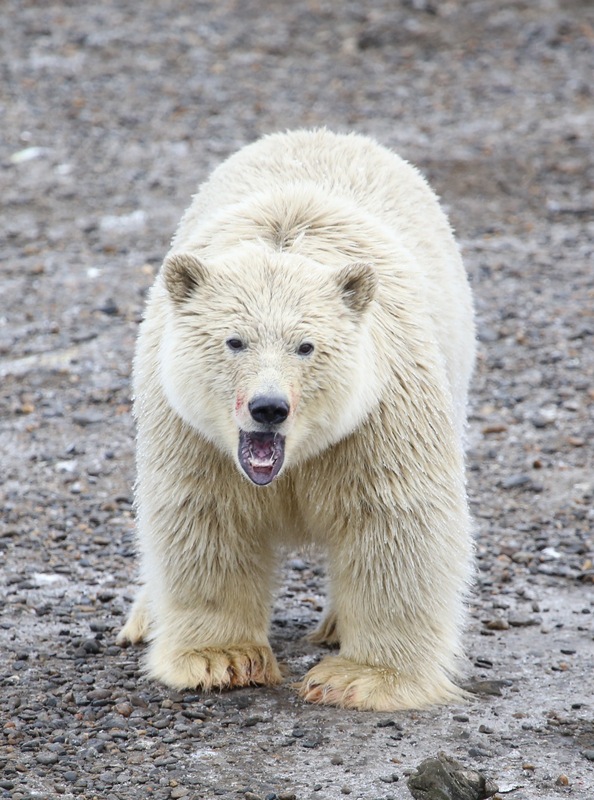 He took offence at every comment and every request and was determined to spoil the experience of watching the polar bears for each of us. 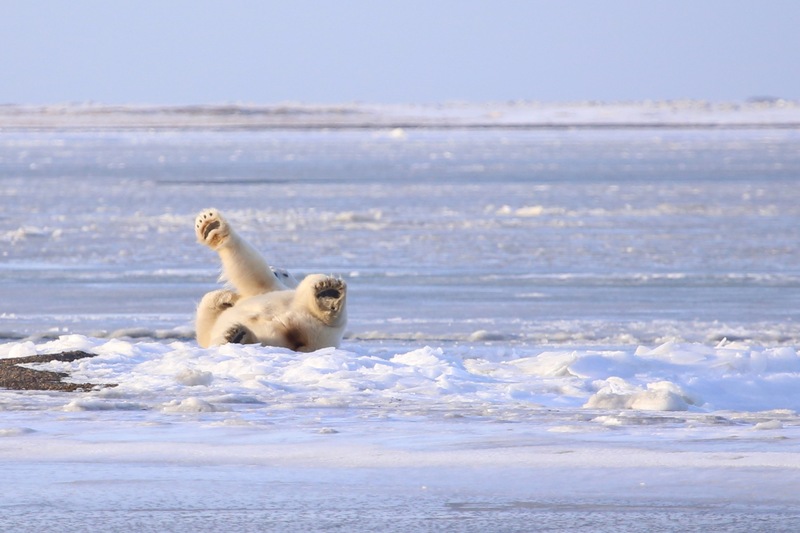 What was worse was that he seem to abdicate his responsibility for watching for polar bear as we peered through our lenses. In the strong winds it was impossible to shoot from the top of the bus as our cameras were shaken by the strong winds. It was, however, possible to shoot from the back of the bus where there was a small platform which led to the platform on the top of the bus. From here one could shelter from the wind behind the bus, but it was not as safe as being out of the reach of the bears on the top. This made Don nervous and at times Bailey would not allow anyone to shoot off the back of the bus. If anyone was able to head out there, he did not seem keen to keep an eye for bears. It became clear that our policy of appeasing Bailey was not working and eventually Scott told him that he was sick of his antics and that he was ruining our very expensive trip. Both Don and Aaron had been wary of confronting Bailey as they were afraid that this would cause his behaviour to escalate but Scott’s admonishment did seem to do the trick. 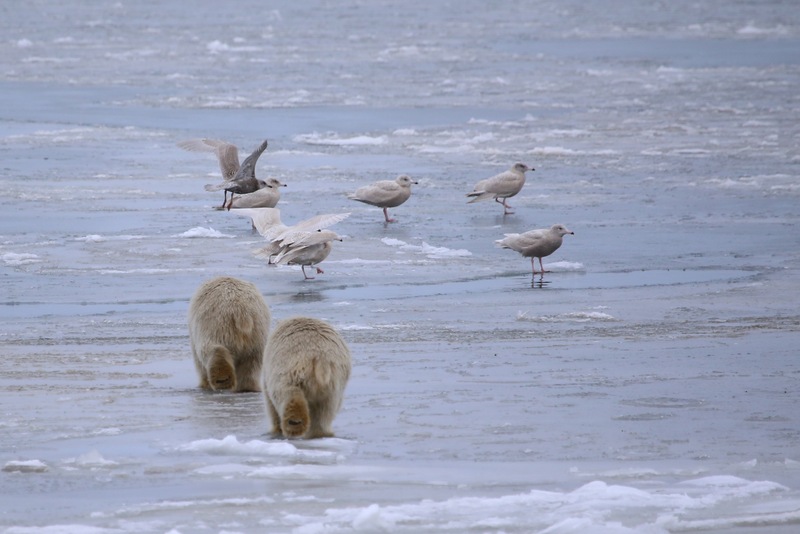 Unlike many wildlife guides around the world, Bailey had clearly turned to polar bears not out of love for the animals but because he had few other options in the small town of Kaktovik. 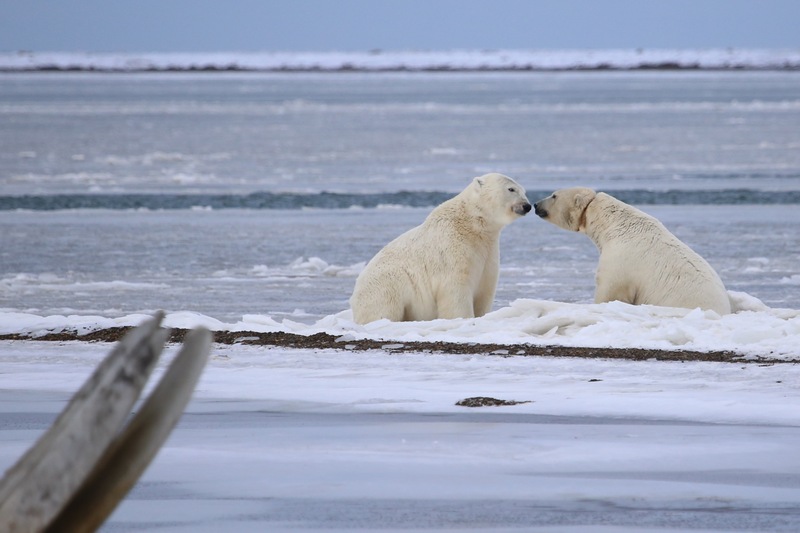 Life in such a tiny and remote town must become rather claustrophobic and it was clear that Bailey resented the visitors that came with very expensive camera equipment from all around the world to photograph the polar bears that he sees as a menace. Even once Don had promised we would not see Bailey again, it was rather a case of too little too late and we decided that we would not go out with Don on the bus that afternoon. Instead, all of us apart from Kathy piled into a van made available to us by the manager of the Marsh Creek Inn. It soon became apparent that in the high winds we could only safely shoot out of the front passenger window, where I was seated. We could not risk opening the van doors to shoot from the back as in the strong winds it was not possible to close them quickly. In close proximity to polar bears this was essential. 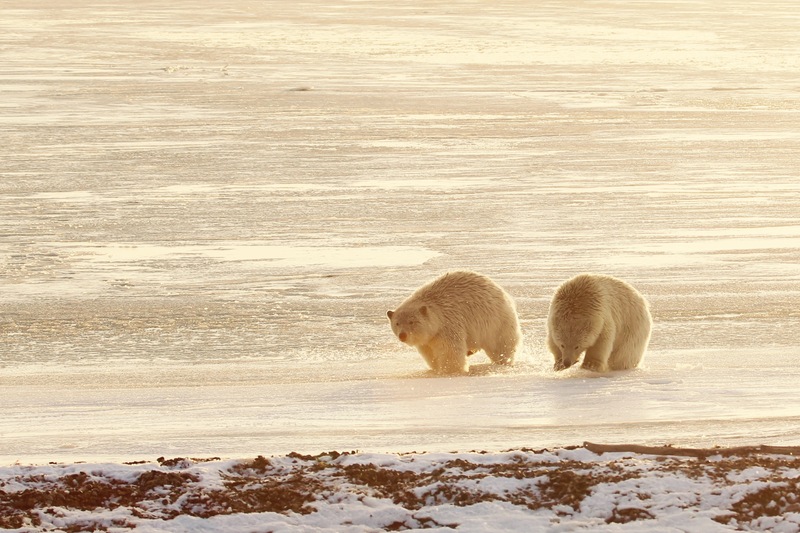 When we arrived at the bone pile, we realised that the light was the best it had been since our arrival in the Arctic. 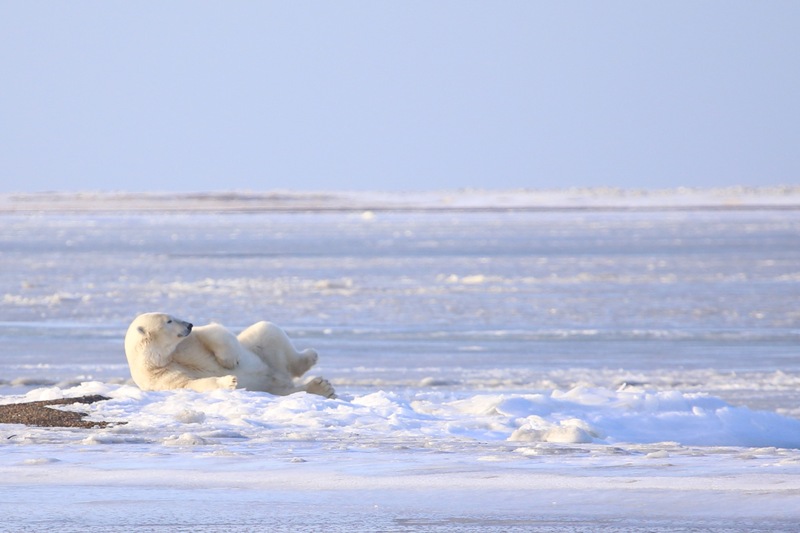 We could see a bear lying on the ice about 80m away from us. It was occasionally rolling around and showing off its huge paws. After I shot a few images of this I swapped with the others in the back and as I did so the bear started to walk towards us across the ice. 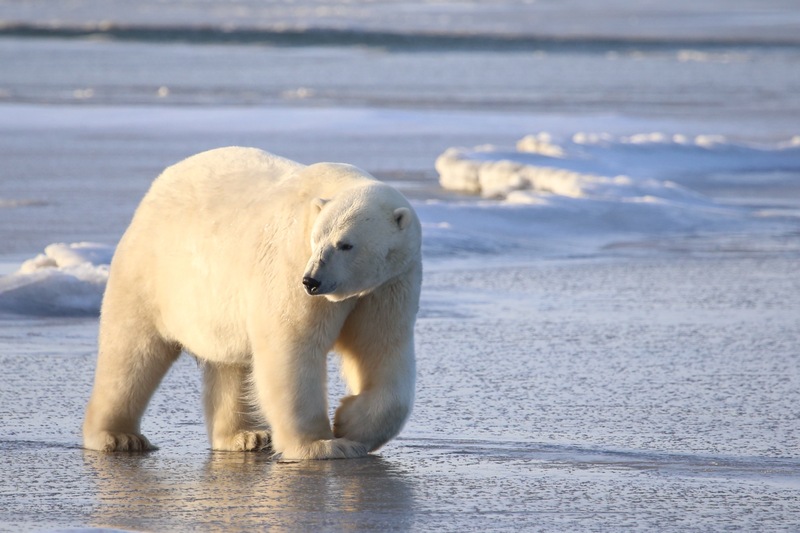 We quickly rotated through the passenger seat allowing each of us to fire off a few shots of this perfectly white bear on the ice in the gorgeous low afternoon light. These few frantic minutes gave each of us the best shots we had taken all week. Eventually the bear got so close that we had to move. 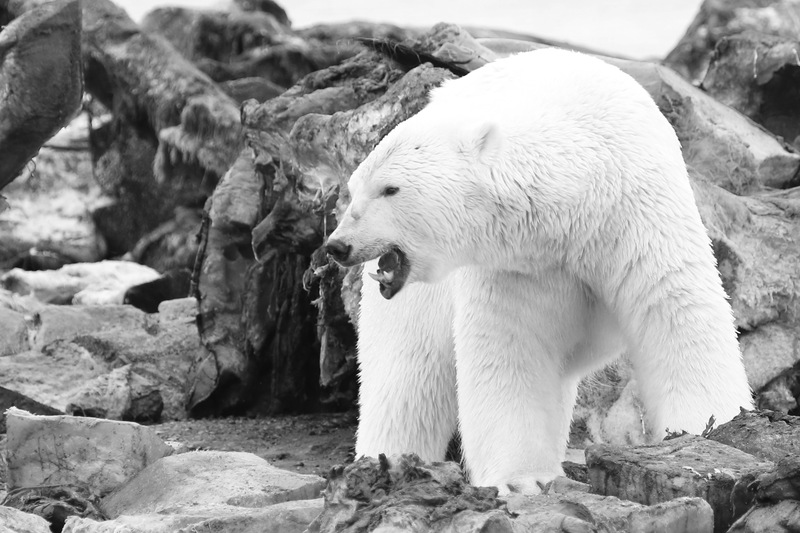 Ignoring the vehicles that scrambled to get out of his way, he strode across the ice calmly towards the bone pile to feed on the whale carcass. 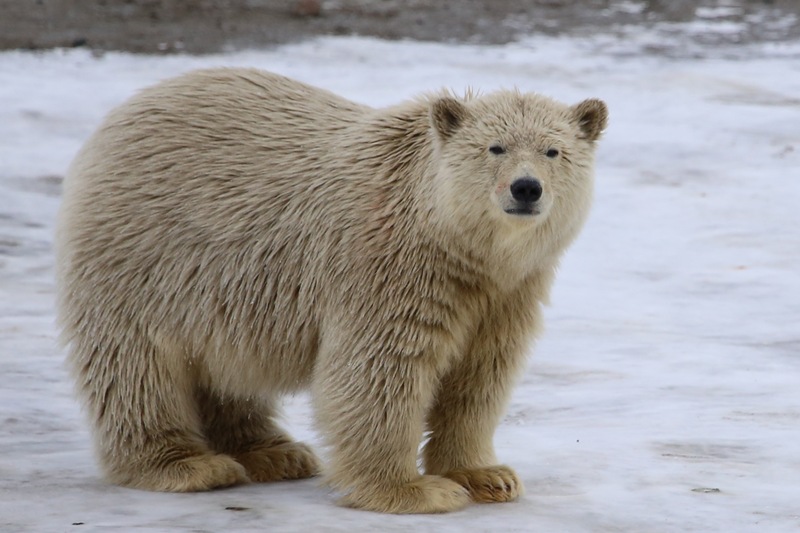 On our second night at the Marsh Creek Inn, we attended what we thought was going to be a talk on polar bears, only to be introduced to a group of local teenagers. I think they were supposed to brief us on polar bear safety (walk, not run, to the nearest house and ask the occupants to call the polar bear patrol) but since we were not sure of the agenda we ended up asking about life in such a small town. It has a nice school, with only one to three students in each year. They play basketball and volleyball, since these require small teams and can be played indoors. One girl stressed the difficulties of dating in a town where all the other teenagers are her cousins. We discovered that in their spare time, they like to hunt anything and everything. One told us he especially liked beluga whales, as they seldom get to eat them. Hopefully we managed to tread the line between being interested and being patronising and intrusive. If we failed, sorry kids, but we weren’t expecting to talk to you! Even though at times it did seem like we had spent a lot of time looking at the bone pile, when going through our pictures we could see we had managed to get a variety of different shots. 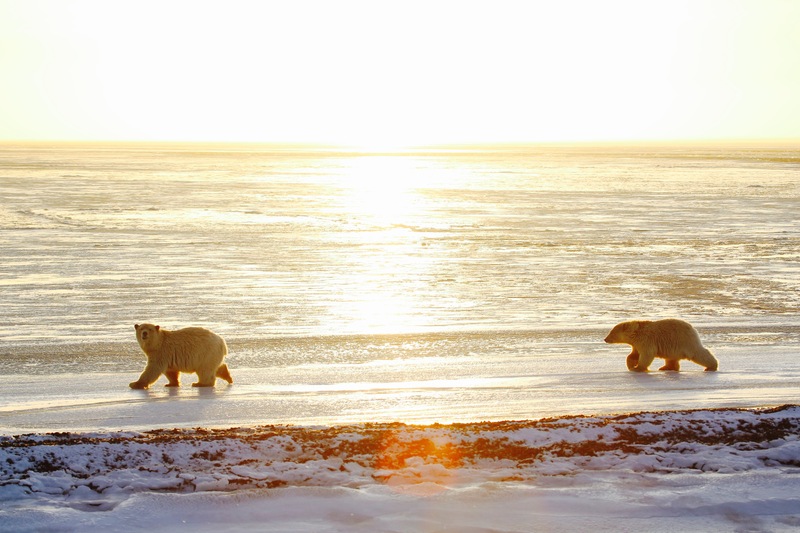 As well as lots of gory bone pile pictures, I had great shots of the grubby twins playing, the same two silhouetted against the sun, and a series of comical shots of one poor bear as it struggled to pull itself onto the ice, pulling some effort faces for the camera. We managed to leave Kaktovik together and on time, once again piling into a small plane and flying back to Fairbanks via Prudhoe Bay. This time we did not have to change terminals, so we made it back to Fairbanks uneventfully. Fortunately we were, for the most part, a rather laid-back group who were not too thrown by the changing travel arrangements and the cranky locals. 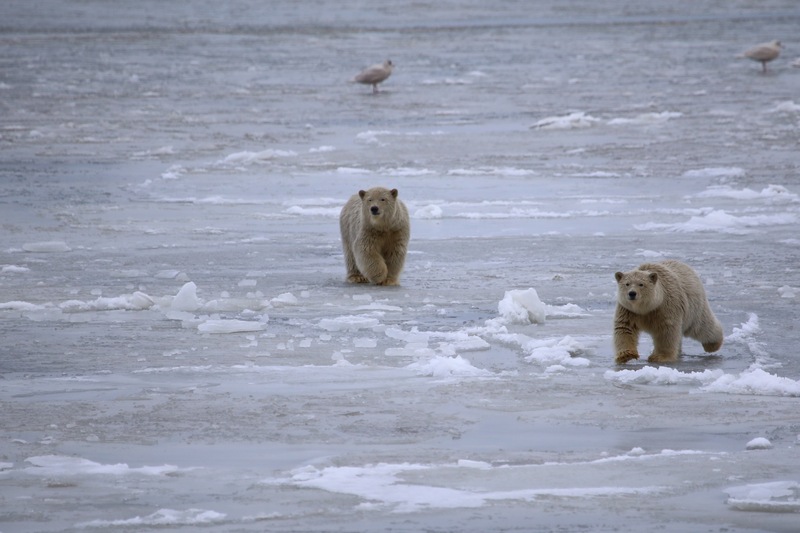 Overall the experience was all about the polar bears, and we certainly saw more than our fair share of those. 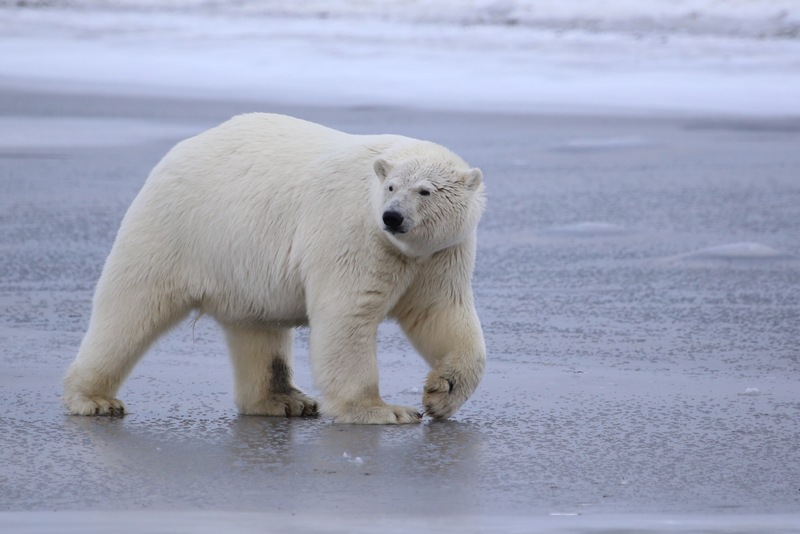 This entry was posted in Kaktovic and tagged Barter Island, Fairbanks, Kaktovik, Polar bears on 18/10/2015 by paulaclarke. Great pics and as always a great commentary.